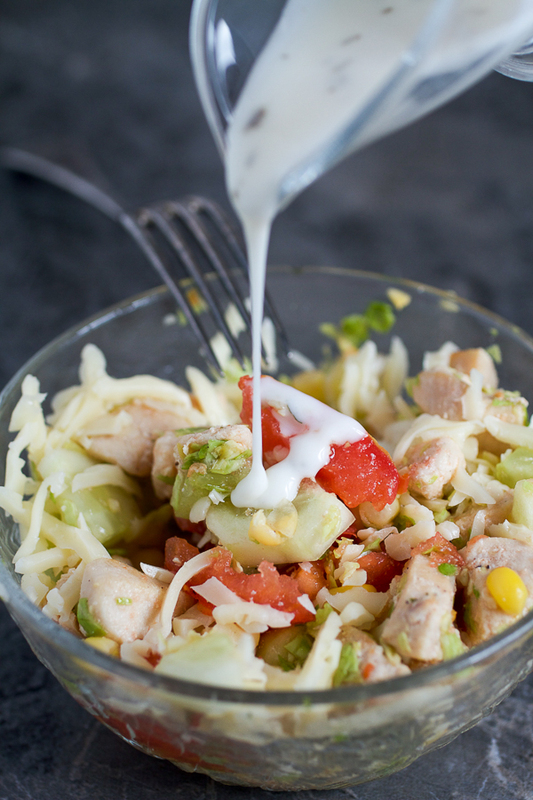 Chicken on a bed of shredded cabbage, mixed with summer favorites (corn, cucumbers and tomatoes), and topped with grated cheese and your favorite dressing. You’re in for a treat. We don’t do al lot of salads, or 30-minute recipes together. Today we’ll do one that’s both. I heard about this salad from my picky niece. She’s 17. I remember I was picky too, at 17. What I remember from that period is if the food didn’t taste absolutely delicious, I wouldn’t touch it. This chicken salad, then, had potential. What sealed it was finding out my brother in law liked it too. For him to ask for a salad meant it had to have great substance. I probably mentioned this. Regional obsession for meat here is unparalleled. Let me give you just one example: a lot of people in the Balkans eat lamb on biweekly basis. Lamb as in delicious, but quite heavy, red meat. Biweekly as in every 10-15 days. Although, veal takes the crown in the meat popularity contest. It’s in everything. Sauces, stews, pies and barbecue. I’m half expecting to come across a veal baklava one of these days. Poultry, while omnipresent, isn’t well liked. It’s tolerated. Even though both my niece and brother in law liked this salad, I still needed a third sign before coming anywhere near it. The third sign came in the shape of shredded fresh cabbage. I cannot begin to describe to you the joy I feel when eating fresh or fermented cabbage. It’s directly proportional to sadness I feel when eating lettuce. As shredded cabbage is this salad’s base, it directly impacts the freshness and the feel of the salad. 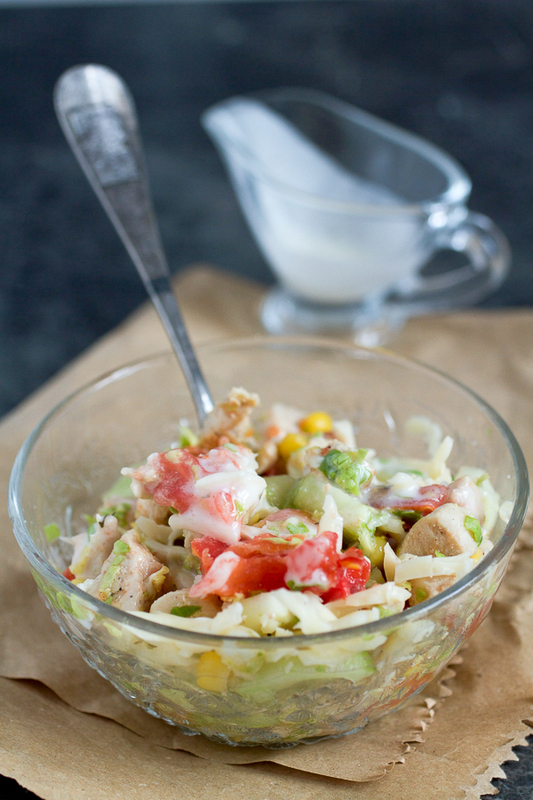 The cabbage is topped with corn, peppers, cucumbers, tomatoes, and finally chicken. 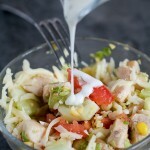 Final touch comes in the form of grated cheese, and optionally, your favorite dressing. The chicken plays a great part in this recipe. I have to say, I more than tolerated it. I devoured it. For the first time in my life, I understand what is meant when people say that protein makes all the difference in a salad. (In my case, it has to be meat protein.) Chicken transferred it from the appetizer to main course category in a hot minute. Thinking of a salad for lunch? This is it. Dice chicken. Heat up oil in a large skillet over medium. Add chicken and seasonings. Fry 10 minutes or so, until the chicken is finished. Meanwhile, place corn in a smaller pot, add water and bring to a boil. Drain and wash under cold water. Once the chicken and corn are ready, let them cool off for a few minutes before adding to the salad. Shred cabbage and place in a large salad bowl. (If you’re using lettuce, chop it finely and add now.) Dice tomatoes, cucumbers, and peppers. Mix well. 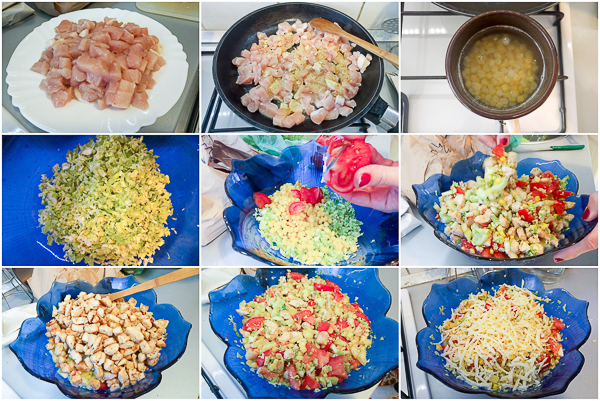 Top with chicken and corn, and mix again.